PLEASE NOTE: Most of the figures, illustrations, and movies contained herein were not produced by the author of this page, and the author does not claim any credit for them. Although the text is original material, the majority of visuals were found on the web. How could two stars ever possibly shake hands? Of course do not have literal hands, but it is possible for stars to exchange mass. By this I mean that gas from the outer layer of one star can spill over onto another star. The key idea to remember is that star's come in a diversity of types. The main feature that determines star type is its mass. One thing that is interesting about the mass of a star is that it governs how bright a star is and how long a star can live before it runs out of "fuel" to burn through nuclear fusion in its core. When that fuel is spent, a star can expand to vastly larger sizes than normal, and it turns out that stars with more mass will do so in less time than stars with less mass. How does that relate to mass transfer? 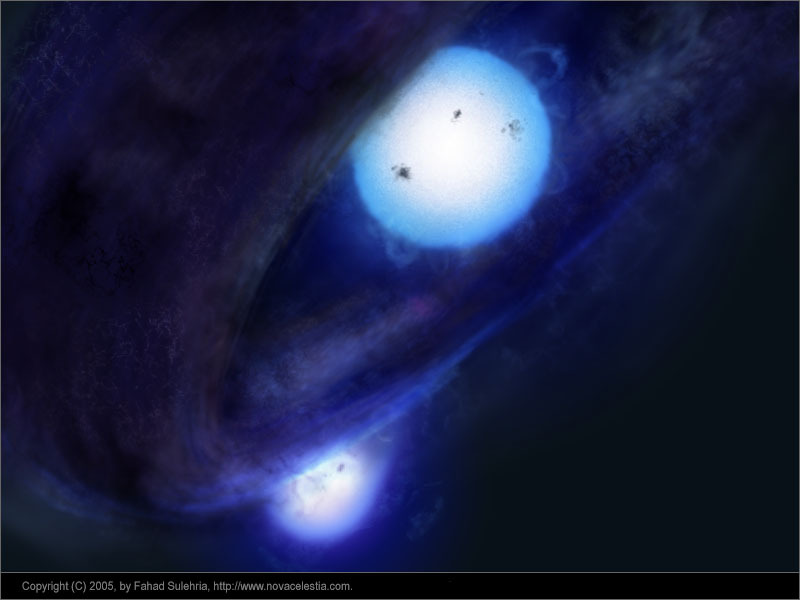 About half of all stars come in pairs, known as "binary" star systems. Some fraction of these pairings consist of two stars that are relatively close to each other, close enough that when the more massive component of the pair eventually grows to large size, gas from the big star can be siphoned by the smaller one. Think of it this way. We launch satellites into space, such as communication satellites, that orbit the Earth. However, we have also sent probes to the Moon, and upon arriving, they orbit around the Moon, not the Earth. This suggests that there is a place of confusion for orbits. I mean, there is a place where a satellite could orbit the Earth, but might just as easily orbit the Moon. In the case of binary stars, when one star gets big and the two stars were fairly close to begin with, then this "place of confusion" (maybe a better word is "uncertainty") can lie quite close or even in the atmosphere of the big star. As a result, the little star can take ownership of some gas that previously belonged to the big star. And that means there is mass transfer. 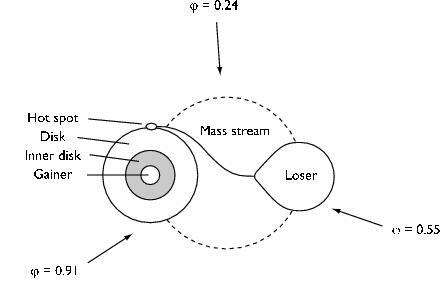 Guess what: If mass is the most important quality for determining what stars do, then mass transfer changes what they do! It also creates a lot of new features in the environment of the two stars that would not be present if there were no mass transfer. Let me discuss one example system that I happen to be studying now. The two following figures show the observed visual lightcurve of the eclipsing binary, Beta Lyrae. This system consists of two stars, one that is a giant star, about 15 times larger than the Sun, which is vigorously losing mass to another star that we cannot see directly. The mass transfer is so great, that a swirling disk of gases form around the other star. This disk is rather tall, about 12 times the size of the sun, and since we see the disk very nearly from the side, the star at the center of the disk is entirely hidden from our Earthbound view. The first figure shows how the light from Beta Lyrae changes over its approximately 14 day orbital period. There are two eclipses: a deeper one when the more luminous giant star is partially blocked by the disk, and a less deep one when the giant star blocks the light from the glowing disk. (Also shown is where Beta Lyrae is located in the constellation of Lyrae, where for reference the bright star Vega is also shown.) The figure below this is the same lightcurve, but plotted differently. The first lightcurve shows the brightness of Beta Lyrae is "magnitudes", which is a system of brightness used by astronomers. The second one is a little easier to read. The lightcurve is plotted in relative brightness. For example, the big deep indicates that the system becomes half as bright when the giant star is eclipsed, and but about 70 percent as bright when the disk is eclipsed. The illustration gives an artist's coneption of how the system might appear if we were observing it from a nearby location. Using the Japenese X-ray satellite Suzaku, collaborators and I have observed Beta Lyrae in X-ray light. The following is an image of Mira, a different star but also a binary, as observed in X-ray light using the NASA Chandra telescope (left), along with an artistic illustration of the binary system (right). X-rays are an important different look at systems like Beta Lyrae, because the X-ray light traces very hot gas in the system, of millions of degrees and higher. For Beta Lyrae, this kind of light is thought to come from the flow of gas moving from the giant star and crashing into the disk that surrounds the other star. We obtained three different observations of the binary system, as shown in the next figure from a top-down viewing perspective. The results of our observation are shown next, in what is called a "spectrum". For white light a spectrum would just be a rainbow of colors: violet through red. A spectrum for X-ray light is the same thing, except that the colors are subdivisions of the X-ray band, instead of white light. 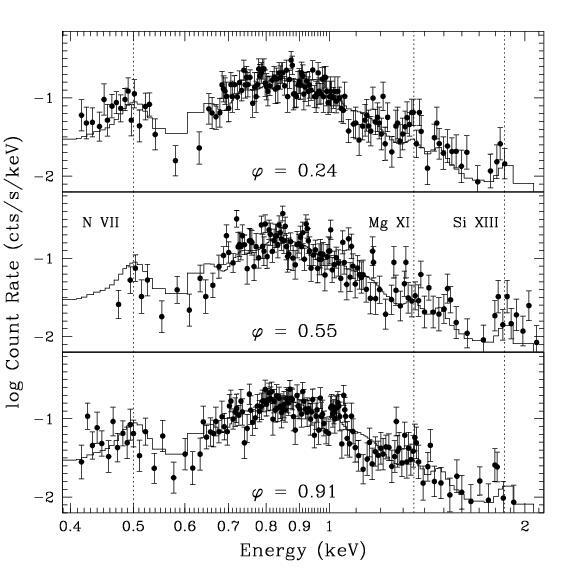 Although the labels may look a little funny, the horizontal axis is X-ray color (as described by "energy"), and the vertical axis is brightness (as described by "count rate"). The points are measurements along with measurement errorbars. The histogram curve is a model that does a good job of representing the actual spectrum. Although plenty X-ray bright, what is remarkable about these curves is that first, there is no obvious eclipse, and second, there is in fact very little change at all between them. This is very surprising. It means that even though we do not have telescopes that are capable of seeing separately the giant star and the other star with disk, the absence of an eclipse at X-ray colors is somehow describing the geometry of the flow interactions in this wonderful binary. Stay tuned. The following are some movies of flow in interacting binaries. These are not real, but computer simulations inspired by real stars. All of these come from a website at the North Carolina State University, from Astronomer John Blondin's group.